If you need to convert your Excel spreadsheets to PDF, fortunately there are numerous ways to do that. Among other things, Cometdocs is an Excel to PDF converter online which offers both free and paid services. Bellow we will show you three ways to use Cometdocs web services to convert files, in this case from Excel to PDF. Depending on your budget and the needs for PDF conversion, you can choose the most suitable package. Two of them are free whereas the last one only costs $9.99 per month. When you visit Cometdocs website, click on Go to Web App button and then on Upload. You can upload file from a computer or Google Drive or Dropbox. Click on the uploaded Excel file and on Convert tab. Drag the file in the Convert tab. Click on the first option, to PDF. Enter your email and click Convert. You will soon receive an email with a download link to your file. The downside of this option is the limited number of conversions, only 3 per week. Also, you cannot store your files on Cometdocs cloud. However, you can transfer (send) your files to someone else or host files on html links for 24 hours. Daily file transfer is up to 100MB. If you register for free the conversion process is the same but you can also click on Store tab and save your files in your Cometdocs account. You have 2GB of online storage. When you store files, for example Excel files, you can convert them later as well. In that way, you can skip the first step of importing a file and simply find the Excel file in your Store section. First click on the file and then on Convert button. The next step will be the same as with first “no registration” plan. Choose the type of conversion and convert. Since you are signed into your account, you will not be asked to leave email address and the converted file will be available in your Cometdocs account. You can keep it there, share it, send it to someone else, and even Download it. As for transferring files to someone else, daily file transfer is 1GB. Host links don’t expire in this case. Users who decide to register for free to convert Excel to PDF online, they will have up to 5 conversions per week. If you choose a paid subscription, the conversion process is the same as with the second plan, “free registration”. 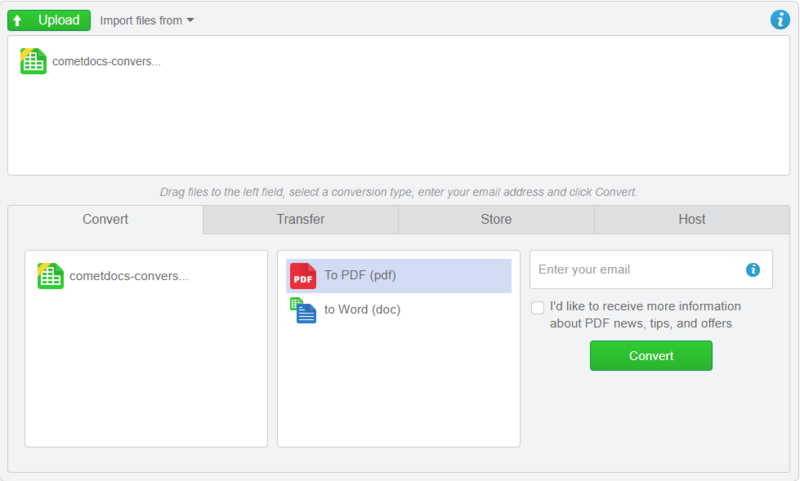 So, you will not be asked to leave an email and when you choose to convert Excel to PDF, you can download that PDF directly from your Cometdocs account. Unlike the first two options, this one has unlimited number of conversions, which is a great solution for businesses. You can store converted files, and the storage limit is much bigger- 10 GB. The biggest advantage of this plan is the priority conversion, which is very important, especially if you want to convert a big Excel file to PDF. Even daily transfer limit is higher, so you can send up to 2GB to other recipients. While with the previous plan you can transfer files to only one person at the time, with this paid subscription you can transfer files to 10 persons at the same time. The image above explains the difference between the free and paid subscriptions.